So when you use this product it is important to do the following first: 1] Siphon out as many flatworms as possible. 2] Keep sufficient fresh activated carbon in a canister ready. 3] Turn off UV, ozone and remove activated carbon. Keep the skimmer turned on. Below given remarks are a.o. meant to reduce the amount of the flatworm's toxic body juices in the water. 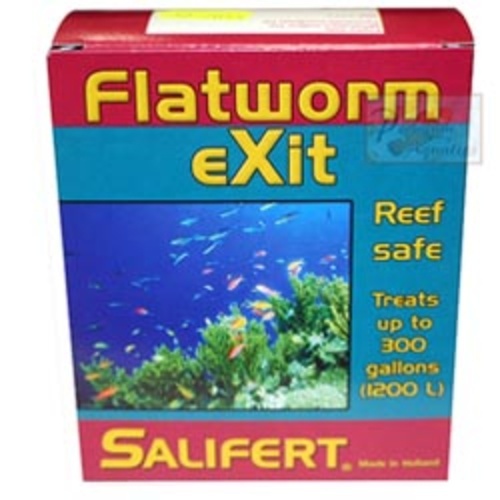 Many people have treated their reef tank(s) successfully using Flatworm exit without any problems. The most important factors are reducing the number of flatworms before commencing with the treatment and reducing the amount of the flatworm's body juice, released when they die, as fast as possible. Furthermore do not underestimate the amount of toxic body-juices these flatworms can excrete. 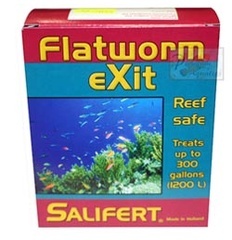 This can be reduced significantly by really siphoning out the flatworms before commencing with the treatment. Further significant reduction is accomplished by siphoning out as many dead flatworms as you can. 1 drop for every 4 liters or 1 gallon. The dropper contains approx. 300 drops (10 ml). The dropper cap holds approx. 90 drops. So 1 cap full is good for 360 liters or 90 gallons. Add it in a high flow area of the tank. If you want to treat a refugium only and its volume Is too small for using a powerhead then mixing should be done manually. As soon as the flatworms start to die commence with the activated carbon to take out any toxic body juices. Also see the above given important remarks. After an hour or so you can turn any UV or ozone on again.